Spinach & feta is one of my favorite flavor combinations – as you probably remember from the Spinach Feta Burgers I shared earlier this week. There was one gift I was hoping was under our tree this year – a crepe maker. I absolutely love crepes and we’ve made it a Christmas breakfast tradition at my mom’s house but I wanted a crepe maker of my own to make my own creations like these Greek Crepes. These are so tasty and I’m pretty sure crepes will now be part of our regular menu around here! Before I get to the recipe, many people have asked me what a crepe maker is. Here’s the Salton CM1337 Crepe Maker that I received for Christmas. It’s cordless and works really well. The basic crepe portion of this recipe can be used for any filling – sweet, breakfast, supper, etc. If you’re looking for a delicious sweet crepe to try, we love these Cinnamon Bun Crepes. Crepes: Mix flour, salt, and eggs on low speed. Add milk and water gradually. Beat until smooth then mix in salt and butter. Follow the directions on your crepe maker to make the crepes. Put the cooked crepes aside. In a large frying pan, cook the cream cheese, sausage, spinach, artichokes and mushrooms over medium-high heat until mixed well and bubbling. Remove from heat. 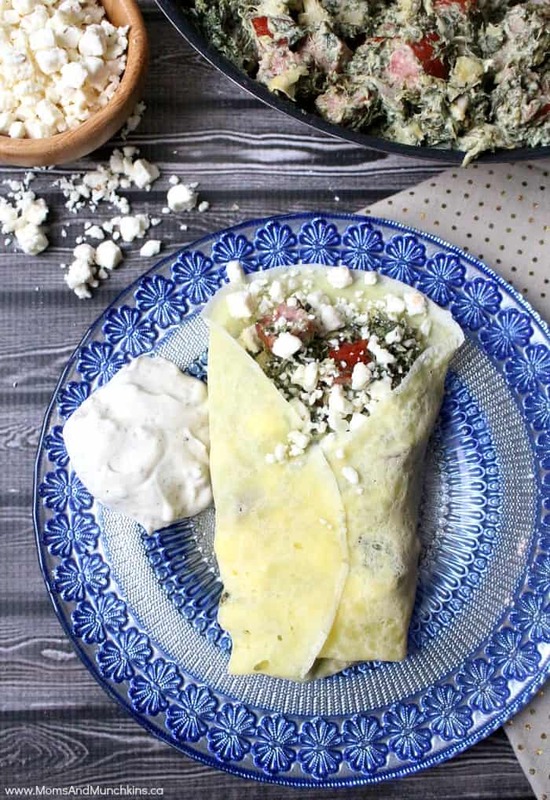 Put some of the spinach mixture in each crepe, sprinkle with about a tablespoon of feta cheese in each, close the crepe and serve hot. Top with a yogurt-based feta dressing. For more tasty recipe ideas, visit our Party Food and Family Meals page. We’re always adding new ideas for recipes and family fun. Never miss an update by following us on Facebook, Twitter, Pinterest, Google + and Bloglovin’.